It was a few weeks before Christmas and I found myself barreling down I-55 on my way to Oxford. Although I was heading north under the guise of picking up a year’s supply of first editions from Square Books and looking into hand crafted wood works, the real reason for the trip was a pilgrimage to the third of John Currence’s Oxford Empire, Snackbar A year’s supply of positive press had left me dizzy with Snackbar’s potential, but with pleasant yet slightly underwhelming experiences at Big Bad Breakfast and City Grocery, I was curious to see if Snack Bar could live up to the food and travel press hype. Unfortunately, Sam and I arrived in Oxford a little too early and ran out of things to do and extra money to spend. 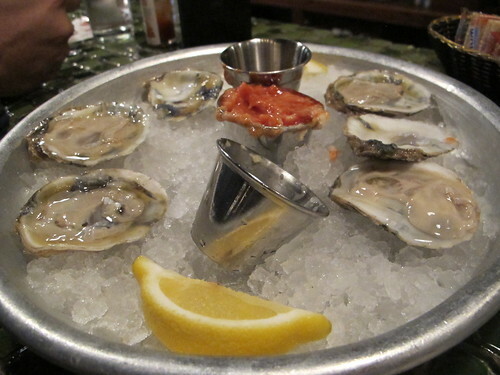 Instead of milling around the seasonally vacant square, we drove to North Lamar just in time for the oyster bar to open. 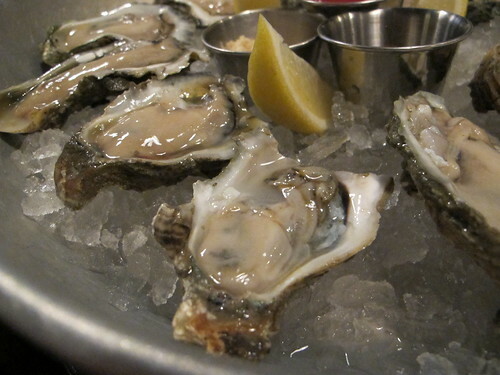 Of course, we did what comes naturally at an oyster bar. First was a taste of seasonal cider based libations. 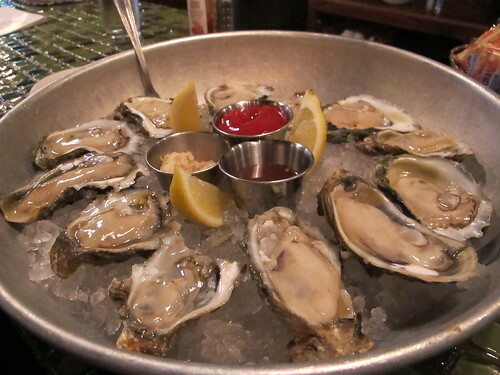 Next was an order of the smallest & briniest Apalachicola oysters Snackbar had to offer. Several cocktails and 30 something oysters later, the restaurant was finally open and we shuffled the ten feet from the bar to our booth. 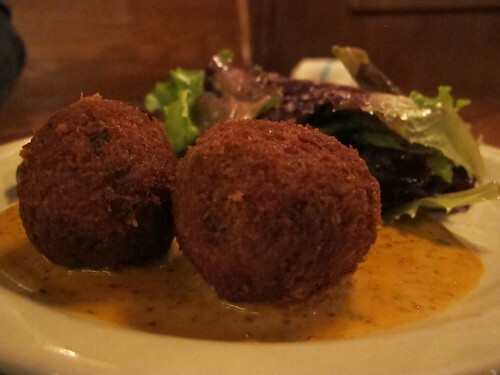 Once seated, it was time to explore the real Snackbar, starting with an order of boudin balls. 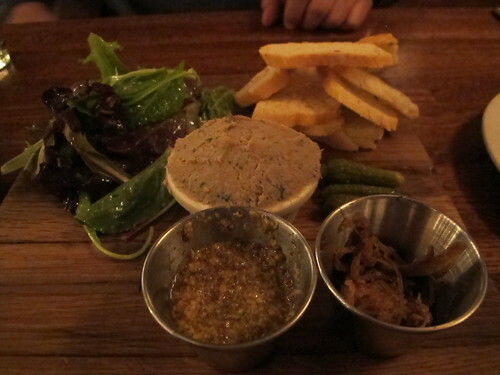 A duo of well-crafted pork and rice creations arrived in a pool of mustard with a side salad and a few cornichons. Years of trips to Houston have given me plenty of opportunity to explore the various boudin ball shops along I-10 and these rank with the best that south Louisiana has to offer. Beneath a divinely thick, crispy skin is an earthy filling of pork and rice. Spicy and meaty on its own, but better with the mustard, the only true complaint was the quantity. 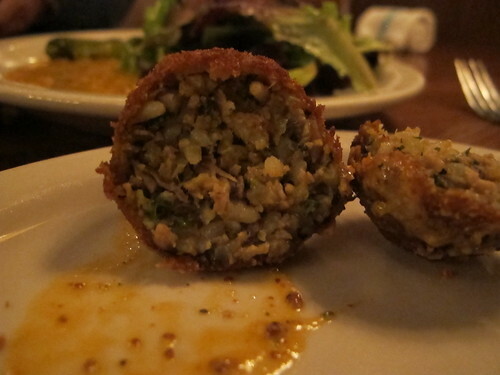 Why must there only be two of these deep-fried beauties to an order? After hours of driving and waiting, one appetizer wouldn’t suffice. 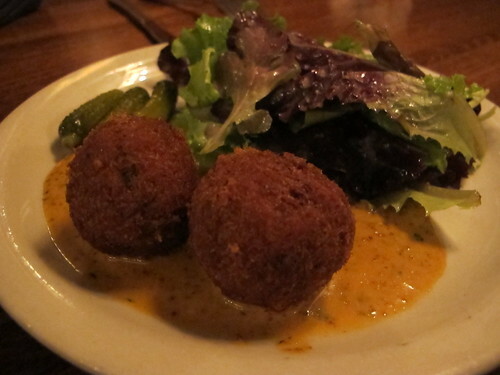 This meant an order of duck pate wasn’t far behind the boudin balls. 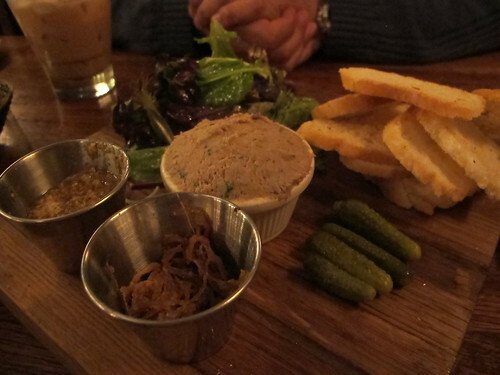 Besides an overflowing cup of pate, this plate came armed with grainy housemade mustard, caramelized onions, a side salad with tart vinaigrette, and a few more cornichons. 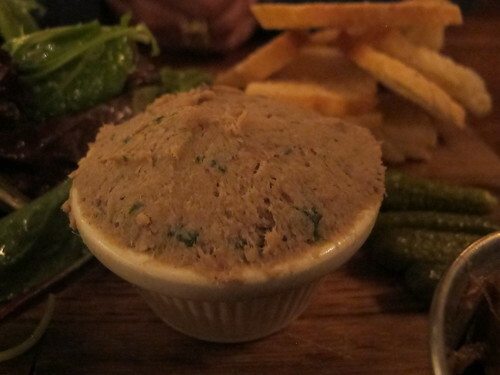 True to its name, this pate was smooth, meaty, and brimming with condensed duck flavor, but what was surprising was the bold flavor of thyme. Despite how it sounds, the thyme didn’t overpower the duck; it was a pair of equally prominent flavors that was only ameliorated by a dose of caramelized onion and nasal clearing mustard. Call it enjoying the menu to the fullest or call it being greedy, but I convinced Sam we had to try the burger. 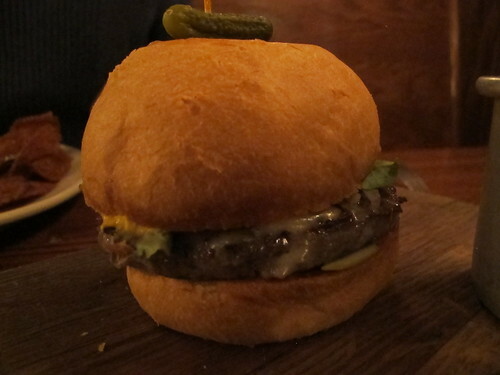 So, in addition to our entrees, one Snackbar burger made an appearance at our table. Reminiscent of so many quality Atlanta burgers, this cheeseburger featured a foundation of White Oak Pastures beef with BBB bacon, house cheddar, onions, pickles, spicy yellow mustard, greens, and house ketchup all on a house brioche bun. With a solid patty to bun ratio, this burger carried a relatively subtle beefiness that was accentuated by the spice of BBB bacon and the vinegary crunch of the pickles. Cooked to a picture perfect medium rare, this patty had the BBB bacon built in. Hitting the high notes of well-rounded beef flavor and a spicy kick, the only thing that kept this burger from near perfection was a good sear. As much as I enjoyed this made from trimmings burger, I was missing the ethereal contrast of well-seared crust to medium rare interior. 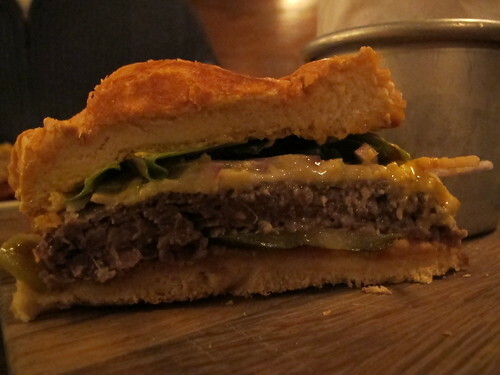 It’s a personal niggle but it was the only thing this otherwise superb burger was lacking. 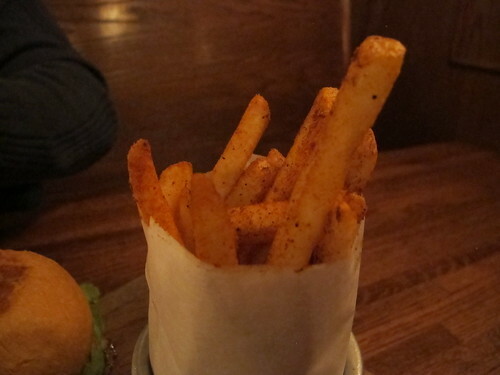 Accompanying the burger were the relatively inconspicuous fries. 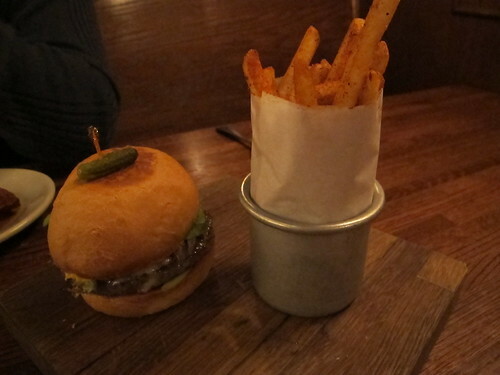 Not particularly crispy and paling in comparison to the burger, these fries were still a quality side. A healthy dusting of peppery, smoked paprika didn’t hurt either. Setting the burger & fries to the side, the purportedly rarely offered grillades and grits played the role of my entrée. To the untrained eye, that may look to be little more than chunky tomato sauce with a few green onions on top. 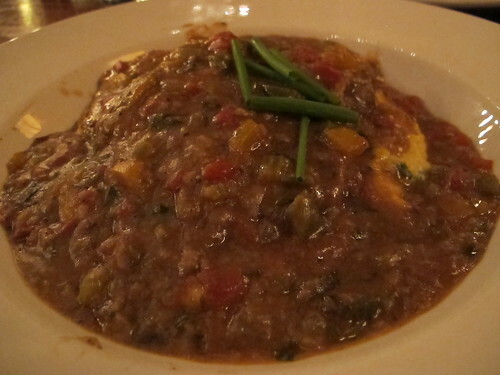 Underneath that mass was a pair of sizeable veal grillades, sublimely juicy and covered in hearty poblano tomato gravy. 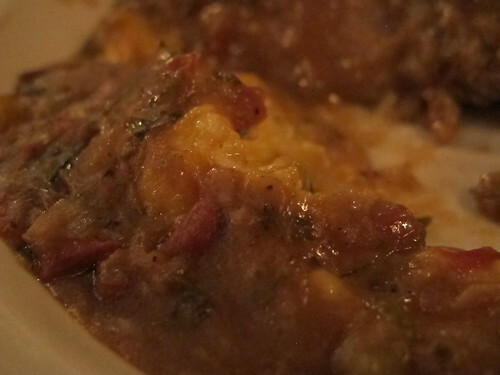 This was Louisiana comfort food done expertly well. 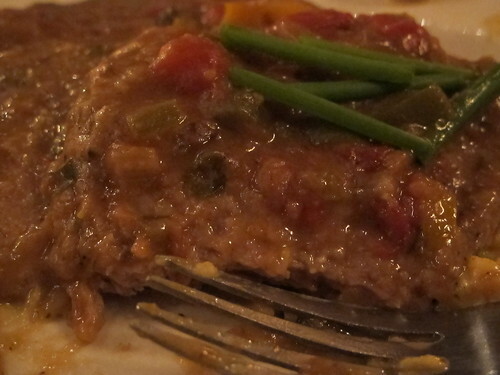 It was a stick to your ribs affair that left me savoring every bite of grits and veal with just the trail of spice on my lips to show for it. 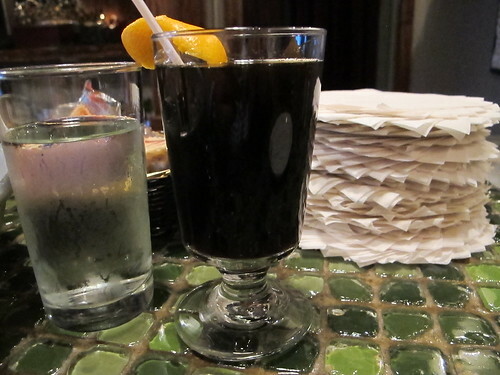 More often than not, I arrive at a restaurant that has been showered with local, statewide, and national praise and leave feeling mildly if not completely disappointed. However, Currence and his masterpiece named Snackbar bucked that trend. Every drop of ink that’s been spilt to extol the virtue of Snackbar has been worthwhile. From the sublime Apalachicola oysters to the BBB bacon infused burger to the veal grillades, nearly every dish was worth the drive. Without succumbing to ridiculous gastronomic hyperbole, Oxford, Mississippi has a poorly hidden gem in Snackbar and John Currence. If you’re within driving distance of Oxford, drop what you’re doing and head to Snackbar; it’s worth it.